We were a little apprehensive about setting out for Vanuatu without the rest of the rally nearby as the weather report we had received was predicting winds gusting to 40 knots and very high seas. However, we decided to take a chance. It certainly was not a comfortable passage, but it was calm enough for me to do killer sudokus and to start a knitting project. In hindsight, it was an EXCELLENT passage compared with the one the rest of our friends had when they left Fiji a week later. Nearly every boat had breakages and knockdowns. One even had a fire aboard due to flooding inside the boat and damage from that water in the electrical system. The passage weather plan from Bob the weather man in New Zealand was pretty well spot on- except for the wind direction at times. We arrived within a half hour of his prediction. We will definitely consult him (for a fee, of course) when we leave for Australia later this week as that passage is notoriously difficult. 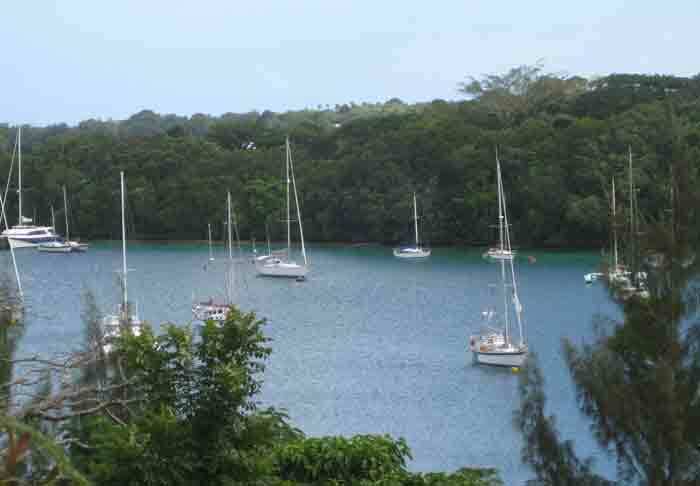 It was such a relief to set the hook by the Quarantine buoy in Port Vila. However, we arrived at 4:00 p.m. and the Quarantine office was closed. No problem, we called "Yachting World" marina and asked them to arrange for a visit at 9:00 a.m. on Wednesday. By 10:00 a.m. we were calling Y.W. again to find out if the health inspector was still coming. They had yet to find him, so offered to have Moses, their boat driver take us to customs and immigration. If this had been Fiji, that would NOT have been allowed- no setting foot on the land until they were satisfied you were not a danger to the community. Other than having to write a book on your cruising history for customs, this was a very painless experience and allowed us also to get local currency (vatus= "rocks" in the local language) to pay the Quarantine man and immigration. Next we followed Moses into the marina mooring field. We were glad to have his knowledge of the course as the depth went down to 4 feet beneath us and we had to pass under power lines strung across the moorings to Irririki Island! We had originally intended to tie up to the sea wall, but changed our minds when we learned that there are dengue and malaria mosquitos in Vanuatu. Since I had contracted dengue fever in Aruba two years ago, I didn't wish to risk getting the hemorrhagic form the second time around. Now DEET is my morning perfume- mixed in with sunscreen scent! It has been wonderful to have a time to "decompress" after our hectic trip to Canada and the punishing pace to try and catch up to the rally. 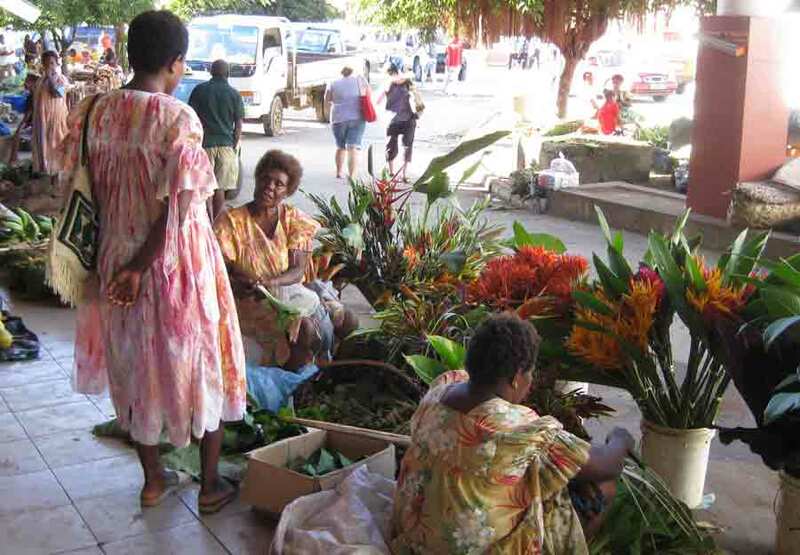 Walking around Port Vila has been good exercise and very colourful. This is a view of ANGEL from the hill beside us. ANGEL is in the foreground to the right. The local market is the best I have seen anywhere. In my last blog notes I showed photos of the local villagers in Fiji weaving palm frond baskets for carrying root vegetables. At the Port Vila market, all the produce is carried to and from the market in these same baskets. You can tell by the cut and style of the Mother Hubbard dresses that the missionaries had a role in designing them. Most of the local women of a certain age and older wear them. Actually they are very cool in a hot climate (if not exactly "cool"). The younger women wear blouses or t-shirts and long skirts, occasionally jeans. A woman showing her thighs is considered a loose woman! At the 30th Anniversary of Independence activities, the woman and little girls in Mother Hubbards looked like a flock of colourful tropical birds. Across from the market is a great mural depicting life in one of the many villages in Vanuatu. Note the harvesting of local produce and the emphasis on raising pigs (or capturing wild ones) for protein. 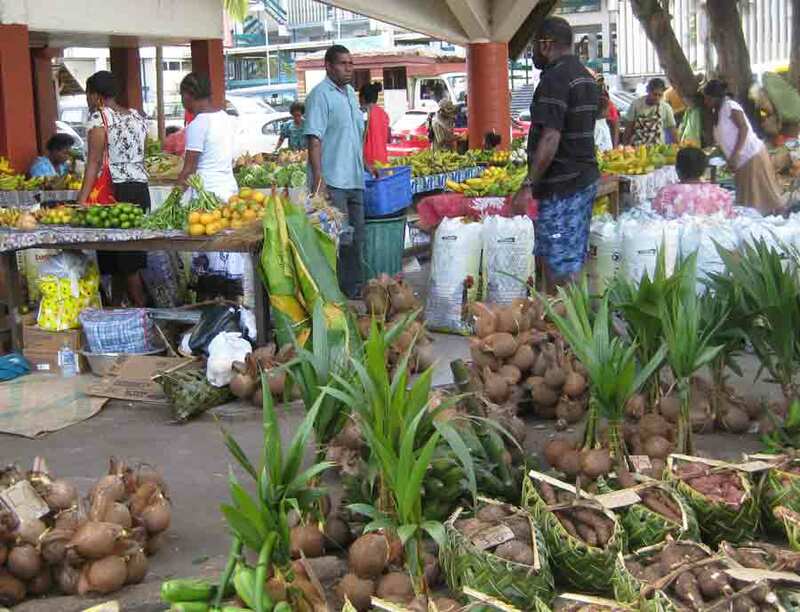 Vanuatu is noted for its consumption of only organic foods. There is no need for pesticides or fertilizers in this lush climate, which is, apparently free from crop-destroying pests. 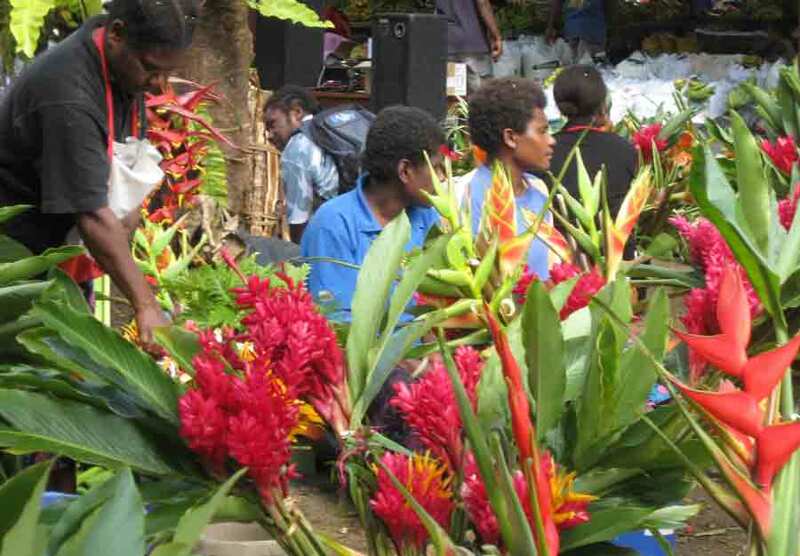 There is always a huge crowd of villagers at the market, selling and preparing their products for sale. Others sell freshly cooked meals. 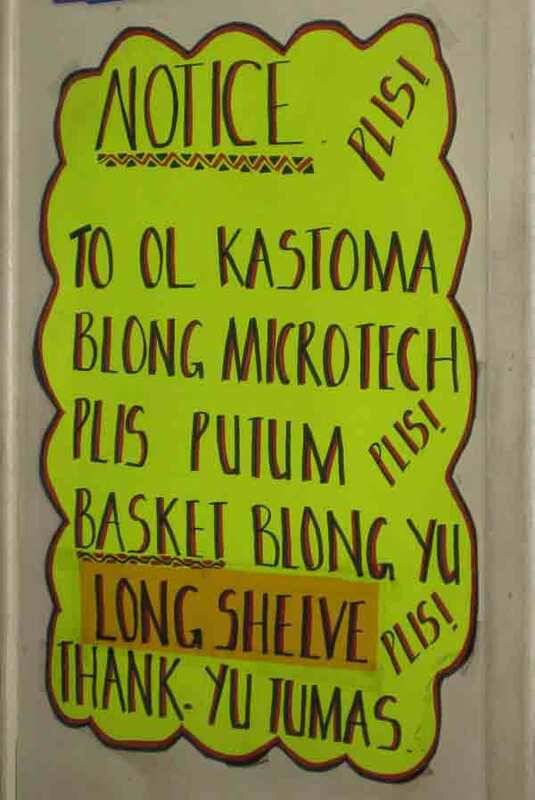 There is never a push for one to buy and questions about the various foods are answered politely and with a smile. There is a huge tourist trade here as cruise ships arrive several times a week. There are many duty free shops with everything you might wish to buy- electronics, jewellry, designer bags, perfumes. My favourite place to shop is the handicraft market down at the waterfront. I have purchased three elastic-topped dresses for about $15.00 apiece and a couple of cloth bags for about $5.00 apiece. The women make these themselves. Sometimes you can see them sitting on the grass with old hand-turned Singer sewing machines. Tours and adventure activities are available everywhere- with a hefty price tag. One is the helicopter tour, with its base right off the waterfront in the middle of the anchorage! 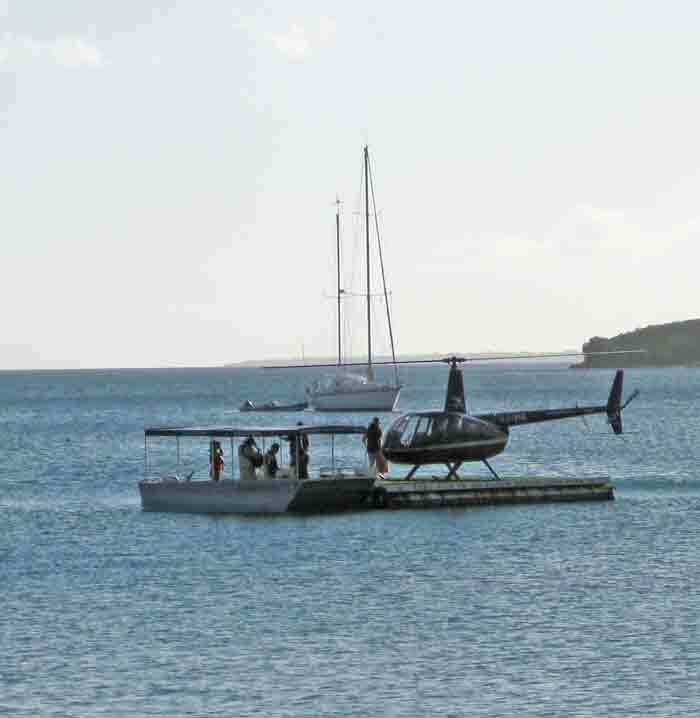 Helicopter landing in front of us as we sit at a bar waiting for the sunset. Food here is not cheap, but, with the islands' French background, it is definitely delicious.